Astronauts on the space station saw ESA's ATV-5 during a special "flyunder" maneuver on Aug. 8, 2014. An unmanned European space ship as big as a double-decker bus will leave the International Space Station tomorrow, signaling the end of a line of cargo ships that had delivered supplies to astronauts since 2008. Packed with astronaut trash, the European Space Agency's (ESA) fifth and last Automated Transfer Vehicle (ATV-5) will undock from the orbiting outpost Saturday morning (Feb. 14) at 8:41 a.m. EST. At first, ATV-5 will be steered to a safe distance from the space station. Then on Sunday (Feb. 15) the cargo ship will slip out of its orbit and make a steep dive into Earth's atmosphere over the South Pacific. Entering the atmosphere at a shallower angle would result in a larger dispersion of debris and a longer reentry over Earth's surface, according to ESA's ATV blog. But this plan was abandoned after one of the ATV-5's four power chains failed last week. Instead, the ATV-5 will go ahead with the standard steep dive that's brought its predecessors safely out of orbit. "While teams are sincerely disappointed not to conduct the planned shallow reentry, the revised plan doesn’t alter the program's overall success," ATV-5 mission manager Massimo Cislaghi, said in a statement from ESA. "The ATVs are large and complex spacecraft and they have achieved every goal," Cislaghi added. ATV-5 launched for its final mission on July 29, 2014, from the Guiana Space Center in Kourou, French Guiana, atop an Ariane 5 rocket. It was carrying more than 7 tons of scientific experiments and other supplies, including food, drinking water, spare parts and clothing, for the astronauts living on board the space station. The spacecraft arrived at the space station in August and spent six months attached to the Zvezda Service Module. In October, ATV-5 used a special maneuver moved the space station out of the path of potentially damaging space debris (namely, a hand-size piece of Russia's broken-apart Cosmos 2251 satellite). ESA has a tradition of naming its ATV spacecraft after European thinkers who shaped our understanding of space. ATV-5 was dubbed "Georges Lemaitre" after the 20th century Belgian priest and astronomer who put forth a hypothesis about the origin of the universe that later came to be known as the Big Bang theory. Georges Lemaitre was preceded by ATV-4 "Albert Einstein," which lifted off in June 2013. ATV-3, which took off in March 2012, was nicknamed "Edoardo Amaldi," ATV-2 flew in February 2011 under the name "Johannes Kepler," and the maiden vehicle, which blasted off in March 2008, was called "Jules Verne." Overall, those five ATV missions have delivered 34 tons of supplies to orbiting lab. The space station has been continuously occupied by rotating crews of international astronauts since 2000. 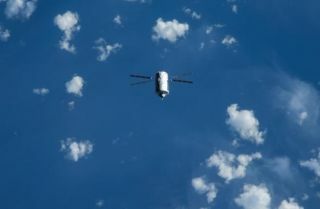 Even with ATV spacecraft out of the picture, there are still several unmanned spacecraft capable of making delivery runs to keep orbiting outpost supplied, including Japan's H-II vessel, Russia's Progress spacecraft, SpaceX's private Dragon capsule and Orbital Sciences' Cygnus capsule. Follow Megan Gannon on Twitter. Follow us @Spacedotcom, Facebook or Google+. Originally published on Space.com.